The Boulder Dushanbe Teahouse is one of Boulder’s most unique attractions. The story that lies behind the teahouse is one that symbolizes years of friendship between two cities on opposite sides of the globe. 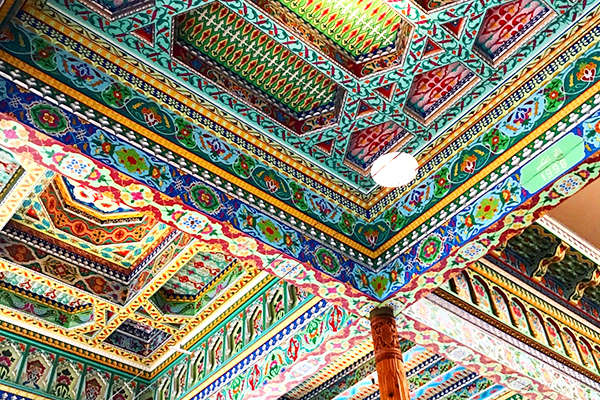 The teahouse was built by hand in Dushanbe, Tajikistan in 1987 and then was gifted to Boulder. More than 40 artisans came together in Tajikistan to create all the decorative elements that went into building the teahouse. The ceiling is hand-painted, the tables, stools, and columns are all hand-carved, as well as the exterior panels. In Central Asia teahouses are seen as gathering places where friends meet up over some tea. In return Boulder gifted Dushanbe was gifted a “Dushanbe Cybercafe”, which holds rows of computers, as well as solar panels outside, giving Dushanbe a high-tech cafe. A fun fact actually is that the teahouse sat in boxes years before it was actually built in Boulder. Once the teahouse was reassembled in Boulder it instantly become a very popular destination for locals and tourists. The colorful interior creates a beautiful atmosphere to enjoy food, and of course, tea. It’s worth it to visit the Dushanbe Teahouse, to experience its cultural ambience, as well as indulging in unique menu inspired by traditional Dushanbe dishes. I made my way to the teahouse for brunch one afternoon with a friend to witness the interior I had heard so much about and seen so many pictures of. It’s safe to say I wasn’t let down by what the Dushanbe Teahouse had to offer. The inside was like nothing I had ever seen, it felt like I wasn’t even in Boulder anymore. My friend and I ended up splitting the whole wheat chai pancakes and the Lapsang Souchong Benedict. The food was amazing, not to mention the chai teas we ordered were super tasty. Their Teahouse Chai is hand-brewed and loved by many, you can even order it from their website! If you haven’t made it out to the Boulder Dushanbe Teahouse yet, then you definitely need to map out some time to get over there! Whether it’s for brunch, lunch, dinner, or even afternoon tea, this is one of Boulder’s most notorious spots that has to be experienced by Colorado natives and tourists both.